Why have decades of school reform had so little measurable effect on student achievement? Why have billions of dollars spent on technology, small-school initiatives, and school-choice options failed to improve our schools? Too often, educators are simply pulling the wrong levers, say Tony Frontier and James Rickabaugh. They explain that the various components of schooling fall into five categories: structure, sample, standards, strategy, and self. 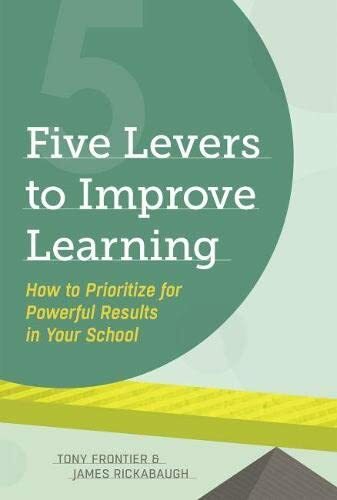 Understanding how these five levers work--and their relative power--can help unlock the potential for lasting improvements in teaching and learning. The authors show readers that changes to structure and sample (how schools are organized and how students are grouped) will not be effective without changes to standards (expectations for student learning), strategy (instructional strategies to engage students in meaningful learning), and self (the set of beliefs teachers and students have about their capacity to be effective). At the heart of this book is a simple message for teachers, administrators, board members, and education policymakers at all levels: the key to success is not doing more work and making more changes, but doing the right work, and making the right changes.